Thursday, December 14, 2017 – CMON Limited announced it will publish Victorian Masterminds from acclaimed designers Antoine Bauza and Eric M. Lang. Originally announced by Space Cowboys, CMON will now release the highly-anticipated game in 2018. 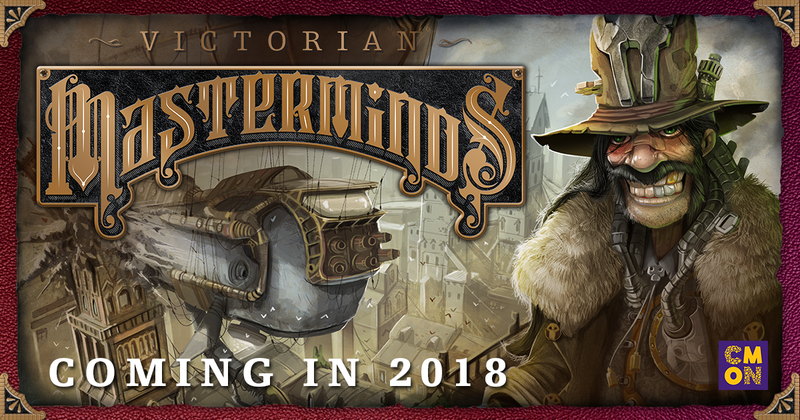 In Victorian Masterminds, 2 to 4 players assume the roles of evil masterminds looking to take advantage of the disappearance of the world’s greatest detective, Sherlock Holmes. While Europe sits unprotected, players send forth their henchmen to different cities to utilize their varied abilities, collect material for the masterminds’ steampunk-inspired contraptions, destroy buildings, and complete missions. Meanwhile, the Secret Service follows their paths of destruction. Every evil mastermind’s contraption is unique and allows them to take different actions as well, leading to highly strategic, asymmetric gameplay. When an evil mastermind completes their contraption or the Secret Service will no longer stand for their villainy to continue, the game ends, and the player who generated the most victory points wins. CMON is pleased to have worked with Space Cowboys to add Victorian Masterminds to its library of games. Fans will be able to find the game at their FLGS in 2018. CMON Limited is an international publisher of board games, tabletop games and apps. Beginning from small hobbyist roots, CMON Limited has grown into a multinational group that publishes several award-winning games, including Zombicide, Arcadia Quest, Blood Rage and more. CMON Limited can be found on the Hong Kong Stock Exchange Growth Enterprise Market under stock code “08278.” Follow CMON on Twitter, Instagram and Facebook.